One city, two different tales. Today I give you the tale of my Mexican friend Claudia mixed with my own tale of a short visit to town. Santiago de Querétaro (or just Querétaro, as it's commonly known) is apparently the safest city with the highest quality of life in Mexico. I did not know that at the time of my visit. Curiosity was what brought me here. My close friend Claudia is Mexican and lives in Playa del Carmen like myself and she just sings the praises of this city. Originally from Torreón (not the safest place in Mexico), she loves Querétaro. Both her sons studied here at the universities and decided to stay and live here after their studies. Fernando is finishing his marketing studies in summer 2017 while Alejandro studied international business. They decided to stay here because they see a lot of business opportunities for themselves. Claudia also comes here for dental conferences. She frequently visits her sons, of course, so I made it a must to stop by during my 10-day road trip with my husband around central Mexico. Claudia with her sons Alejandro and Fernando in Querétaro. Claudia's sons are not the only 'newcomers' to the city. The population of Querétaro exploded back in 1985, following the earthquake that struck Mexico City. Many residents fled the nation’s capital and settled in Querétaro, located just 160 miles to the north. The Organisation for Economic Co-operation and Development has recently called the economy of Querétaro 'the most dynamic in the country'. The growth of the aerospace industry is supported by the city's Aeronautical University. The automotive sector is growing strong alongside the food and beverage sectors (with the presence of companies such as Kellogg's, Gerber, Mars, and Bokados, the Coca-Cola bottler). Claudia's eldest son has already finished his studies and is already employed here and looking at starting his own business. I don't think he would have the same opportunities if he moved to Playa del Carmen, where his mother lives, as tourism is the only industry in Playa. As for our own visit to town, we came by bus with my husband from Guanajuato on the way back to Mexico City, in December 2014. From the bus you can see the modern outskirts of the city, where Claudia's sons live. The Pan-American Highway makes its way beneath the arches of the 17th century aqueduct so you can't miss this symbol of the city on your arrival (photo on the left, courtesy of Flickr. Its construction was the most important urban work of the 18th century. It was built by the Marques del Villar del Aguila with his own money. Legend has it that the Marques offered it as proof of his love for a nun. He built a home where they could both live together in spirit. It is now the beautiful Hotel Casa de la Marquesa. To bring water to the house from 20km away, he built the aqueduct and he shared this water with the public by placing 12 fountains around the city to give them clean drinking water. Secondly, we met straight away the indigenous people. A lot of indigenous women with babies were sitting on the pavements, some selling artefacts, others begging. The indigenous people walk the city selling their artefacts. In all honesty, it was a bit heart-breaking. Claudia assures me that they must go elsewhere now as you won't see that sad picture in the centre any more. The question remains, how do they make a living? They all wore traditional Otomí costume: a wrap skirt, a blouse, woven sash, apron, rebozo, and quechquémitl (cape), wrapped around their bodies. The Otomí had become dwellers in Querétaro in pre-Hispanic times, alongside the Chichimeca tribe. Wikipedia tells us that they were originally wild nomadic people with no fixed dwelling places, lived by hunting, wore no clothes and fiercely resisted intrusion into their territory (which happened to have silver mines the Spanish wanted so much). Today the indigenous people farm (slash and burn style), raise livestock and produce artefacts. 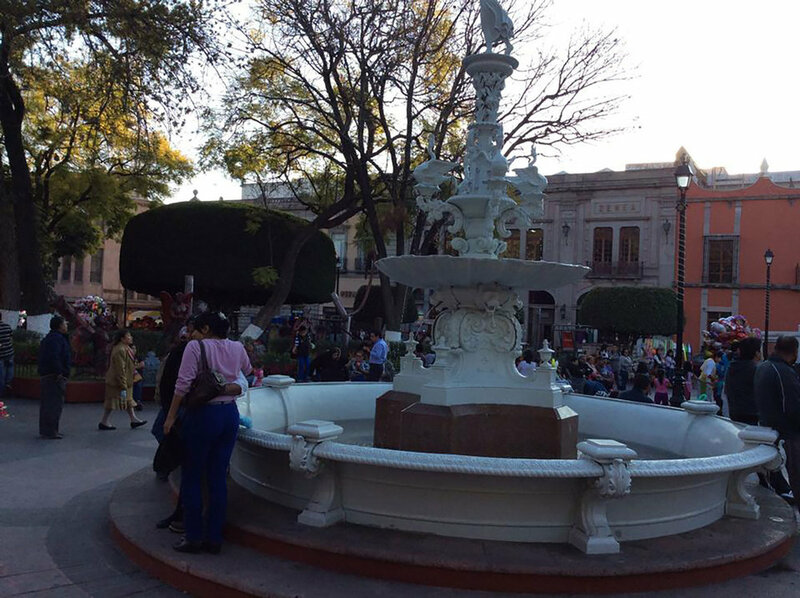 Historical Centre of Querétaro: livingmagazine.life. As soon as we reached Plaza de la Constitución, we felt a change. The majority of people wore western style clothing and the Plaza itself looked different, very modern among the colonial buildings. We decided to have lunch at Gran Hotel on the plaza, as we were attracted by its beautiful arcades and a lively bar in the 'portales'. Over a good cup of coffee we had a chat with the friendly barman about the stern look of the plaza. We found out that it had recently been remodelled. Originally the square was occupied by the orchard of the convent of San Francisco, after which it became the famous 'debris' market (Mercado de los Escombros). The controversial remodelling took place in 2000, when they built 32 columns around the square, one for each state of Mexico (well, rather 31 states and one federal district). On each one of these columns one could read the names of the deputies of the first post-revolutionary Congress who signed the Constitution of 1917. Nobody seemed to be reading them. A politically correct square, maybe, but without a 'soul', if you ask me. Even for a city that is one of the cradles of Mexican Independence. After our lunch we moved onto Jardín Zenea square, which had an obvious identity. Zenea Garden was named in honour of the governor who constructed it in 1871. Originally part of the atrium of the San Francisco Temple, now a garden square with a fountain (with a statue of the goddess Hebe), tall and leafy trees and a French-style kiosk with music bands. As we were here on New Year's Eve, we saw it at its most colourful, full of Christmas decorations, clowns, children, families and balloons. A real zócalo, with a soul. Just across the road we stepped into another plaza, named after the heroine of the city that we met earlier. Corregidora Square, with La Corregidora statue built to commemorate the centenary of Independence. This is another jolly place, packed with small restaurants and we returned here at night for a New Year's meal at La Fonda Del Refugio. We were lucky they had a place for us as everywhere else was pre-booked for that particular night. Rather basic food, but the midnight glass of champagne was accompanied with fireworks and we did not expect either at a small Mexican restaurant so it exceeded our expectations. Avenue of 5th of May (Avenida Cinco de Mayo). This square led us into the pedestrian Avenue of 5th May (photo above, right), lined with bars and shops. A pleasant stroll indeed, among the colourful colonial buildings. Here we found the sculpture of an Otomí warrior, celebrating the foundation date of Querétaro (1531), when Spaniard Hernán Pérez Bocanegra y Córdoba made a pact with the allied Otomí leader Conín (later named Fernando de Tapia). He was the administrative head of the Otomí people living in Aztec-controlled territory. Legend describes it as a 'battle without weapons'. Shortly after becoming governor, Fernando de Tapia oversaw the construction of the first religious building in the city, the Convent of San Francisco (today it houses the Museo Regional). What went through my mind instantly was the rest of that story, the brutal campaigns by the Franciscan missionaries in the early 16th century to force Indians into slavery and Christianity. My hat off to the urban planners! You stroll for two or three hours and you learn the complex history of the town in such a visual way. As you walk, each corner or structure tells you a story. While we were admiring the Otomí warrior, a group of dancers arrived. They danced right under the sculpture, dressed as Spanish soldiers and indigenous warriors. We did not need an explanation of what it represented. Obviously, the cultural authorities got the show right; it tells the city's story even to people who happened to be there for only one afternoon. Casa de La Corregidora was the next building before we reached Plaza de Armas, the last square of the day. La Casa is the current home of the government offices. Again, a pretty colonial building, (with an open yard for visitors), where the by now familiar Doña Josefa Ortíz de Domínguez alerted the revolutionary Ignacio Pérez that the independence conspiracy had been discovered by the Spanish, prompting the start of the War of Independence. Casa de La Corregidora in the past: livingmagazine.life. The same house now: queretaro10.com. Plaza de Armas (photo left below) is the 18th century plaza, with arcades and mansions that surround a square with a fountain. It was my preferred square of them all, probably because of the perfectly manicured trees which added a layer of elegance. No wonder that the city's historic centre is a UNESCO World Heritage Site. Next time we visit, we'll go with Claudia, so we can experience both faces of this charming city at first hand. By regular intercity buses from Mexico City. You can also get a bus directly from the airport in Mexico City. Just 40 miles west of Querétaro is the beautiful little town of Tequisquiapan. You can buy great art and Mexican crafts here, and it’s also famous for its hot volcanic springs. It is on my list for our return trip. 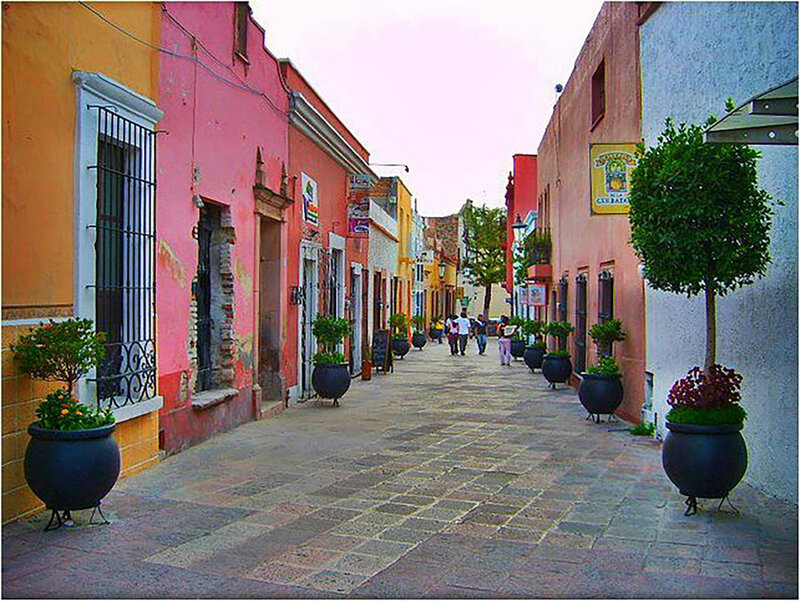 If you have time, visit the nearby town of San Miguel de Allende, another colonial gem. It is only an hour and a half drive and there are plenty of buses connecting the two cities. Discover why it is a World Heritage Site. The city of eternal spring is loved by Americans, for its enchanting cobblestone streets, colonial architecture and great art and bar scene.